It is difficult not to get exasperated while negotiating the bottlenecks that the metro rail project in Bangalore creates every morning. But few, if any, have the time or the inclination to see what’s happening behind those green and white barricades, as here at Minsk Square, behind the general post office, on Monday. This entry was posted in Mysore-Bangalore and tagged Bangalore Metro, BMRCL, Churumuri, Karnataka Photo News, KPN, Namma Metro, Sans Serif. Bookmark the permalink. Its really very pity that in the name of METRO development, we are sacrificing a lot of green vegetation around Cubbon Park, Cubbon Road, Vidhana Veedhi Road, and its surrounding and wherever METRO is stretching. This non-sense of METRO development must be stopped immediately and no further damaging the green vegetation (what our environmentalist are doing!!!!) The cluster of dust that emits every day after night and night is piling up opposite BRV ground and some other grounds, which was once the police training centre and lung space open areas. The scattered dust is equally making “cross pollination” over other residential and commerical glass facade buildings upto a stretch of 10 Kms from its surrounding towards North and West End. (Pollution control board please notice this trend!). We are breathing mud, gargling mud, and our saliva is full of METRO MUD. Lungs infection, bronchitis allergic, everyday cold and cough for people travelling around BANGALORE for the past 10 years and continued for another 10 + 10 years will be the order of the day. BANGALORE had survived without METRO for the past 50 years and would have SURVIVED without this DEVELOPMENT for another 50 years (as we have already without METRO for past 10 years + another 10 years (by the time it gets completed). 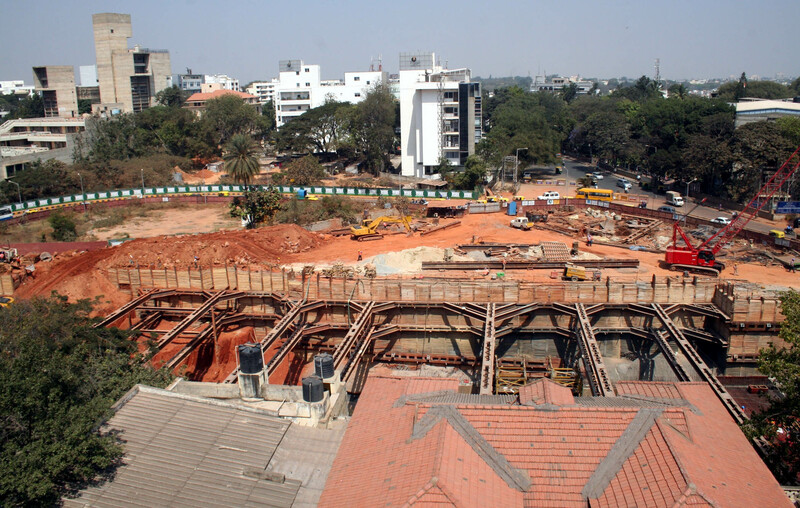 THE famous VIDHANA SOUDHA is now a MANNINA SOUDHA and METRO development authority will not take onus to ‘BATHE’ the soudha after the METRO WORK gets over. Like the files which are already eating dust inside the SOUDHA without PROPER GOVERNMENT functioning will now be ‘COMPLETELY burried” once for all. the SO CALLED WORLD FAMOUS VIDHANA SOUDHA will loose its promiscuity in a short span of time. I remember my father MALUR SUBBARAO and his brother ADVOCATE MALUR SUBBARAO (Gandhinagar) were narrating to me that when late SRI KENGAL HANUMANTHAIAH initiated the action plan to build the VIDHANA SOUDHA and ATTARA KACHERI (HIGH COURT BUILDING), civil engineers of yesteryears like SIR M VIVESVARAIAH, Diwan Seshadri and other promimennt visionaries were contacted and this place of VIDHANA SOUDHA was made selection to bring beauty and city centred activity centre to people of KARNATAKA. Sir M Viveswaraiah had also warned that the building will remain in its beautiful facade, SHOULD no other developmental or any other structural buildings are set up in and around 2 kms radious of this existing VIDHANA SOUDHA building. He had also precautioned that the river which is running as ‘GUPTAGAMINI” underneath Vidhana SOUDHA will erupt after 100 years, should there be any environmental damage to the surrounding. The Cubbon Park, Lal Bagh, Sampangirama Nagar Lake, Dharmambudhi Kere and many other tributary lakes were part and parcel of this surrounding and hence the place of eco-environmental from all angles. PERMITTING NOW underneath METRO and damaging the surrounding will definitely result in big catastrope over the years that is ahead of us. DUE to METRO development work, the TOURISM and Tourist traffic around VIDHANA SOUDHA has drastically reduced for the last 10 years and will continue to be so for next 20 years so. Finally with all these environmental damages, what pleasure we are going to derive by travelling in METROl god alone knows!!!!!! !